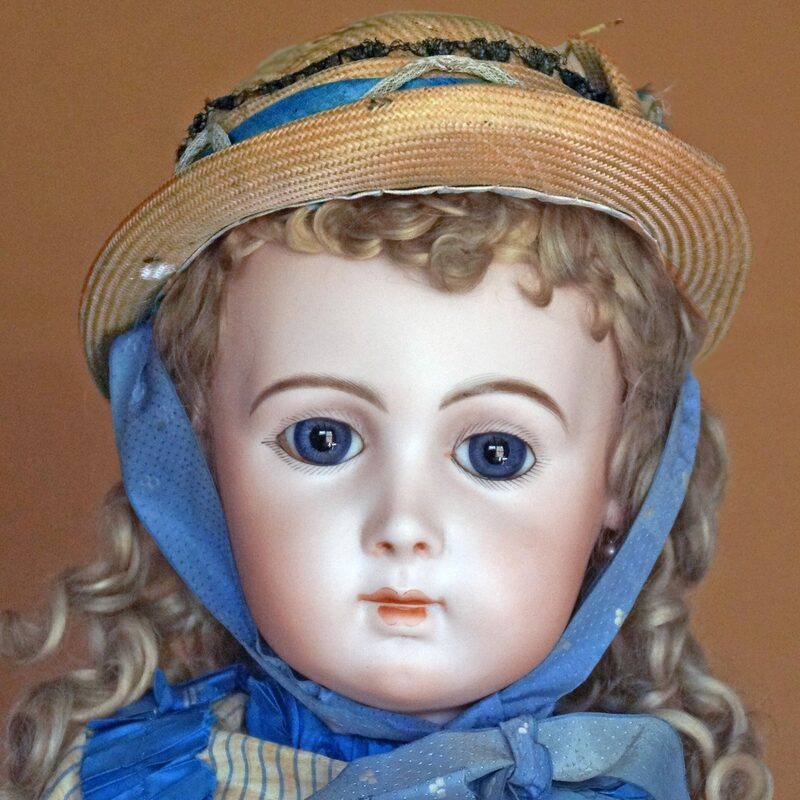 14″ ( 35 cm ) American cloth doll made circa 1940s by ” Georgene Novelties” representing the (United Feature Syndicate ) comic strip character ” Nancy ” created by Ernie Bushmiller. She has a swivel neck on a cloth torso with sewn joints at shoulders and hips. The one piece arms have attached ” mitten -style ” hands, and the straight legs have sewn on black and white horizontally striped ankle sock tops with orange felt covering over the feet to simulate shoes. The dress is made in one piece with white linen arm sleeves and collar, and a black felt top and orange short skirt. Nancy’s face is hard pressed cloth with “button nose”, a tight lipped red smile and nostril highlights, black arched eyebrows, and indented black pupilless eyes. The back yarn wig is sewn on to the head with a yellow silk ribbon bow as a part of the wig. An extra feature is the original cardboard swing tag with all the printed identifying marks and attributions already stated above. In overall very good condition with very minor surface dust primarily on the shoes. …………………..US$ 375. Attractive early 1930’s Lenci girl from the ” 3000 series “. 17″ ( 43 cm ), dressed in a typical regional costume representing the Brittany area of France. Sewn to her apron is a heart-shaped paper tag reading ” Breton “. She has the typical molded pressed cloth head with painted features with eyes glancing ever-so-slightly to her right, an elaborate blond mohair wig with center part and braided bun in back covered by a crocheted snood-like bonnet with gauze and lace front and a blue silk ribbon tied in top front of the head. The costume consists of a dark brown long-sleeved dress with pleated gauze and silk blouse, a silk shawl with fringed edging and a black silk high apron with embroidered colorful flowers as well as a bead necklace. The shoes are brown felt that match the dress ( one missing a bottom sole ) and all the underwear is original layered linen. The facial painting is still bright and clean although is a slight loss of red paint on the lower lip. The overall condition of the costume is also good but with a few moth holes to the felt on the left sleeve and one small area beneath the black silk apron. US$ 975. Hard to find 14″ ( 35 cm ) Lenci child with original miniature wooden tennis racket in right hand with fingers sewn around the object. Underneath the reddish-brown knee-length belted felt coat are green felt short pants, a beige felt shirt with brown felt tie, knit beige socks and hat shoes matching the overcoat. The overall condition is very good with only minor surface dust and still retaining most of the blush on the cheeks. The wig is soft auburn human hair with left side part. No identifying tags seem to be present but her Lenci credentials are undeniable. SOLD.